Head out on a treasure hunt, visit a farm and meet a lazy farmer, or see what life is like on a marine base! 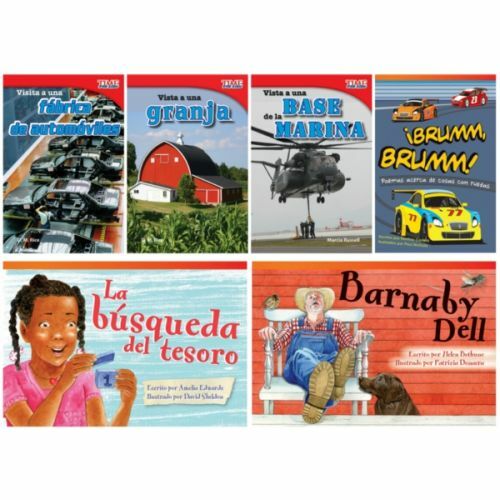 This 6-book collection combines Spanish-translated stories from Fiction Readers and informational text found in TIME FOR KIDS® Nonfiction Readers to introduce students to multiple text types as called for in the Common Core and other state standards. Both the fiction and nonfiction books contain high-interest text, vibrant illustrations and images, age-appropriate text features, and increasingly complex vocabulary. 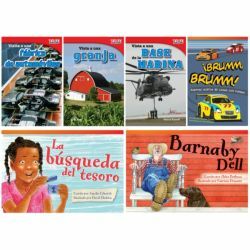 The titles in this collection include: Visita a una granja (A Visit to a Farm); Visita a una base de la Marina (A Visit to a Marine Base); Visita a una fábrica de automóviles (A Visit to a Car Factory); °Brumm, brumm! Poemas acerca de cosas con ruedas (Vroom, Vroom! Poems About Things with Wheels); La búsqueda del tesoro (The Treasure Hunt); and Barnaby Dell (Spanish Version).